Welcome to the “Clout and Climate Change” War Game led by the Center for New American Security. Each delegation of 10 was played by about half Chinese, Indian, US, EU nationals and half US colleagues. Our team of SI contractor Lori Siegel, Ventana Systems’ Tom Fiddaman and I used C-ROADS (formerly called Pangaea) to help delegates understand what climate results their commitments would create. We were honored to work with a great team. Beyond the good folks at CNAS, we got to work closely with Jay Gulledge at Pew Climate and Gary Jacobs and David Erickson at Oak Ridge National Labs. As we had hoped, C-ROADS worked well, helping the parties understand and commit to (as much as possible) mitigation targets. 1. Broad acceptance that use of “climate intensity” targets are poor methods of achieving true emissions reductions. 2. Understanding that “day one” results were roughly halfway to Podesta’s goal and the Copenhagen aspirational target, thus increasing commitment to work with China to achieve bigger commitments. 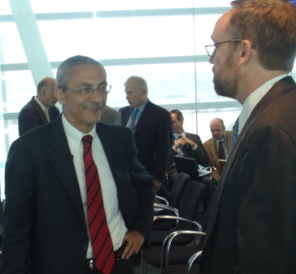 Here’s what it looked like: On the first morning, Sec General Podesta presented a slide deck we built for him using C-ROADS runs, setting the challenge. Later, the US team, for example, would ask its rapporteur to send an instant message to the Control Team, asking for our modeling team to visit. I hustled to the room where the team, headed by Pew’s Eileen Claussen and Senator Tom Daschle, would ask the question — eg, if China and India met its Copenhagen targets, how much would the US and EU have to reduce emissions by 2025 in order to “turn the corner” on global emissions? IE, see emissions fall? Back in the control room, Lori Siegel, Tom Fiddaman and I would adjust the model, create graphs, and report back first to the US team and then to everyone in the morning in a short plenary presentation and handouts. (Answer ~50%) Secretary Podesta would re-emphasize the points in personal meetings with countries. Then a call from China about costs of emissions reductions beyond 20%, and Fiddaman was off to their room. And later, from the Secretary General — if all parties followed their commitments, how much would emissions fall? What would CO2 concentration be in 2100? Are we on track? Along the way, the ABC documentary team was taping everything, gathering material for the show they will air in January on “The Earth in 2100”. Our big contribution: providing fast, clear, scientifically grounded feedback about how potential actions would impact climate results to improve the mental models of decision-makers and hasten action. Another time, after the country leads asserted that “the magnitude of each country’s contribution to global cleanup should be related to historic emissions, current emissions, projected future emissions….”, the Pew team asked us to assemble these data in table and graph form and talk the delegates through the results to make sure they understand it all. 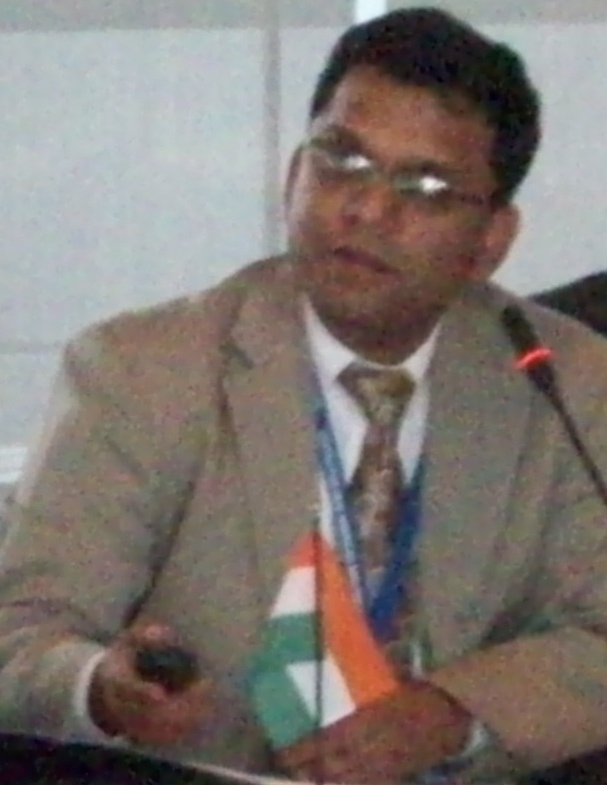 In the game, the Indian delegation surprisingly led the emissions reduction charge – committing to decrease emissions to 30% below 2005 levels between 2015 and 2025. The Chinese seemed to be in the most difficult position — wanting ~7% per year GDP growth to provide jobs and housing for the urbanizing population, tempted to burn their coal to do so, and struggling to find a way to collaborate globally to mitigate climate change. Wonderful, thoughtful others set the context for all this work — Peter Schwartz of Global Business Network helped us use the scenario planning process well and IPCC head R. Pachauri gave a keynote via videoconference on day one. Helping run the game with Tom Fiddaman reminded me of the first international model-based negotiation I played — “SusClime” game built by Tom and Bert DeVries and played at Balaton back in 1993! Only 15 years between development and high-level use!?! Nice summary. Hopefully the next 15 years will bring more change.